Does Wi-Fi come from satellites? For those of us in the telecommunications industry this may sound like a startling question. However it is a genuine question from a member of the public that took part in a discussion about broadband and how it was being marketed. For those of you that might be reading this that also don’t know the answer, no - Wi-Fi doesn’t come from satellites. Wi-Fi is a wireless technology developed for Local Area Networks, and uses standards defined by the IEEE, in this case a bunch of standards under the exotically titled 802.11 banner. Wi-Fi can travel a few metres, it certainly won’t reach satellites. And it doesn’t get you to the internet either, which is another common misconception. To get from a Wi-Fi router or hotspot to the internet, that router or hotspot needs a “backhaul” network to get you to the internet. From home, this would be your broadband connection and everything that goes on beyond there to connect all the way through to the Netflix servers. Wi-Fi has become a near-ubiquitous and very convenient networking technology, an incredibly successful communications innovation. How many of us get irritated when we can’t get on-line, from a train for example or in some instances even hotels? We even expect it for free and when presented with a payment login wall for a Wi-Fi service, I for one will switch my iPhone’s hotspot feature on and use that for practically free. The rise of Wi-Fi has led directly to the café culture style of working - park up in your favourite espresso joint, order a donut, and hit those emails on the device of your choice. And we all have Wi-Fi in our homes too, where there are unintended consequences for the apparent performance of your service. Wi-Fi has many strengths but it also has weaknesses too, and I think you need to be aware of these weaknesses, as you might be blaming your service provider for poor broadband speed (and that’s all to easy to do) when in fact the problem lies closer to home. In your home, in fact. Ironically, as broadband speeds increase, and super low latency “ultra-fast” 1000Mbps services become more prevalent, the impact of Wi-Fi performance becomes more of an issue. The unpredictable and variable nature of slow-speed highly contended copper broadband, masks Wi-Fi issues. In fact, the two can often combine to create a perfect storm of poor service performance. The usual practice of internet service providers when they install your router is to use a short, maybe 2m, cable inside your house so your Wi-Fi equipped router is neatly nestled against a wall. It’s convenient for them for the install, but perhaps less so for you. The reason for this potential inconvenience is that the shape of the Wi-Fi signal is like a donut - think invisible electromagnetic Krispy Kreme Original Glazed - it’s a toroid. Technically speaking it’s omnidirectional - it’s the same in all directions (or almost all directions) which is exactly the characteristics you need for flooding a room or house equally with Wi-Fi from a single point, so everyone gets the same signal. Sadly it’s not as simple as that. As your newly installed Wi-Fi router is likely to be next to an external wall, and the shape of the Wi-Fi signal is to all intents and purposes a sphere, this means much of your Wi-Fi signal disappears out of your house. And that’s not all, but to explain the next bit, I’m going to have to talk technology. A bit. I mentioned the IEEE earlier - the Institute of Electrical and Electronic Engineers (although it’s not the Engineers that are electronic or electrical as far as I know). As I said, this august body sets standards for many things including Wi-Fi so that we can easily connect our laptops and iPads to routers. But standards don’t stand still - they are constantly evolving. So in the consumer space over the last 15 or so years we’ve had a veritable variety comprising 802.11a, 802.11b, 802.11g, 802.11n and the very latest and exciting 802.11ac. Wi-Fi is a radio signal and just like regular entertainment radio stations such as BBC’s Radio 4, it uses specific frequencies or frequency bands as part of the standard. The latest hotshot hotspot standard on the market and being heavily promoted, 802.11ac, was released in Dec 2013 and uses 5Ghz frequency, but to keep it “backward compatible” with non-ac devices, it also supports the older 2.4Ghz frequencies from earlier Wi-Fi standards. Naturally, to take advantage of this, your end device needs to support the same standard. An 802.11g device might well use an ac Wi-Fi router, but it won’t use the 5Ghz frequency. 2.4Ghz is a busy place - it’s a common frequency frequently used by many other things such as bluetooth devices and baby monitors… so there’s a lot of interference through which your laptop has to punch to get to the router and vice versa. All this interference degrades the signal strength and this will cause a reduction in the streamed data rate of your internet connection. 5Ghz is a less-used frequency and is therefore subject to less interference. It’s also faster, so it supports a faster streamed data rate then 2.4Ghz. Those pesky laws of physics though mean that although 5Ghz frequency is faster, it’s strength deteriorates over a shorter distance, it doesn’t go as far. it also doesn’t have so much “penetration” power as 2.4Ghz, so those handy walls you have in your house might be bad news for 5Ghz Wi-Fi. On the other hand, 2.4Ghz punches through walls, so for some types of property, your neighbour’s Wi-Fi might be interfering with yours! Whereas the shorter range 5Ghz option may avoid this issue. Within the frequency bands (5Ghz, 2.4Ghz) are various numbers of discrete channels. If two end devices (PCs for example) are using the same channel, this this can cause interference and spoil your Game of Thrones experience. This is why when you phone up your service provider to complain their broadband isn’t working, they often ask you to change Wi-Fi channels, or they might do it for you remotely. 5Ghz has more non-overlapping channels than the 2.4Ghz band, so again there’s less likelihood of interference which results in a better service experience. 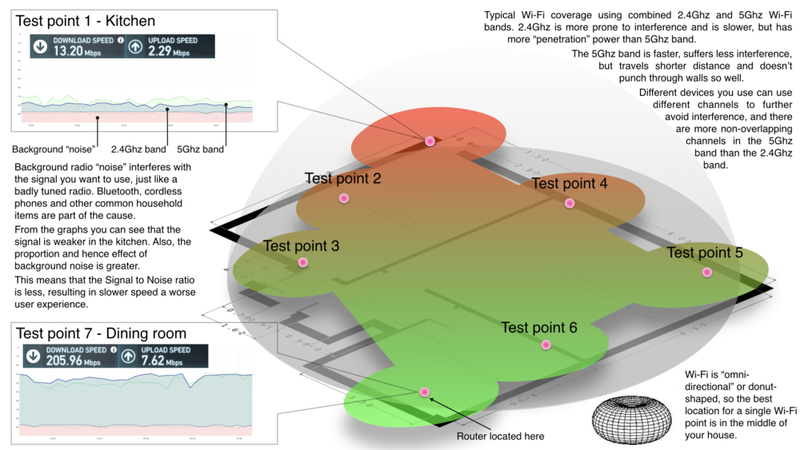 Wouldn’t it be great if you could actually see what your Wi-Fi network looked like, so you could find out how to optimise the location of your router to get the best possible coverage? Well the great news is you can. There are a number of different tools you can use to do this. I used a combination of an augmented reality iPad app from Stanley tools to draw a plan of my house. I then exported that into a MacOS application called Netspot to measure and plot the Signal to Noise Ratio of my Wi-Fi radio network. The more Signal to Noise, the better, the more Noise to Signal, the worse. Test point 7 was right above the Wi-Fi router, which was on a desk in the dining room, tethered to the VirginMedia network access box by a 2m cable. The graph shows a lot of green - the signal - and not much pink - the underlying noise. It's a strong Signal to Noise Ratio (SNR). An Ookla speedtest at this point showed I had 205.96Mbps download speed and 7.72Mbps upload speed. This kind of asymmetry is a common characteristic of copper-based broadband, albeit in VirginMedia’s case where they have their own network, they use copper coax cable instead of copper wires. Test point 1 was a few metres away in the kitchen. Here you can see much less green signal, and although the pink noise has remained much the same level as it was in the dining room, the ratio between the two is vastly different. The Ookla speed test in the kitchen shows the impact this reduced Signal to Noise Ratio has on service speed. You can't change the laws of physics so what can you do about this? One simple thing you can do is to move your router into the centre of your house. I did this by buying a 10m coax cable extension from Maplins, and used that to reposition my router on top of (but not inside) a cupboard so it was higher up and more central. This had an amazing effect on Wi-Fi coverage in my humble abode. Make sure your router uses both 5Ghz and 2.4Ghz frequencies - upgrade to 802.11ac! A recent trend has been to present these two frequencies to the end user as one Wi-Fi network option on your Wi-Fi network picker on your laptop, and it automatically serves up the better of the two signals to you. 802.11ac also sports such exotic technologies as “beam forming” and “MIMO” (Multi In Multi Out) aerials. MIMO is usually either 3 x MIMO or 4 x MIMO, and promoted in such a way to give the impression that 4 x is better than 3 x. But it does depend on the capabilities of your device, so upgrade your devices too. For folk with large houses, or old houses with thick walls, one Wi-Fi source may simply not be enough to provide adequate universal coverage. My parents purchased a pair of “Powerline Adaptors” which simply plug into the mains sockets and uses the electrical wiring to transmit the signal to a corresponding Powerline Adaptor in another room, effectively extending the Wi-Fi range. There are limitations to this though, as Powerline Adaptors need to be on the same ring main. You can add Wireless Access Points (WAPs), which is relatively simple to do, or even build what’s known as a “full mesh” Wi-Fi network, which is at the bleeding edge of Home Area Networking. Or you could simply connect your devices using good old fashioned Ethernet cables. But these may not go very well with your soft furnishings. It’s very easy to pin immediate blame on your ISP for buffering and stuttering issues, especially given the wobbly nature of copper-based broadband. But it might be worthwhile ensuring you have the best Wi-Fi set up possible before once again calling your ISP for support. And should you be fortunate enough to be able to take a real fibre optic broadband service, then take it as this will dramatically improve your whole internet experience.